There are a lot of knitters out there who are capable designers and figure-out-ers who I have heard testify that they never knit anyone else’s patterns, only their own. I admire this, yet also never quite understand how they are able to do that. It’s not just the wealth of delicious knitting patterns that are out there to choose from (I wonder if they miss out on fun stuff as a result), it’s that I wonder how they are able to give their brains a rest once in a while. One of the most challenging parts of my triple life as a knitter/blogger/designer is finding a balance between all three, and some weeks it’s the hardest job of my life. When I’m designing things it means I’m responsible for All The Decisions that go into that thing, and it takes up a lot of my brain energy, and quite frankly some times my brain needs to not be in charge of All The Decisions. Sometimes it needs time to remember that I’m a knitter who likes knitting. I’m in the process of changing over from some finished or almost finished design projects and starting in on some new ones, and took the opportunity to cast on something new that wasn’t something my brain had to be completely in charge of. Of course, it’s still a cabled pullover, which probably tells you something about my particular brain’s idea of “rest,” but you know, it’s whatever your brand of crazy is. 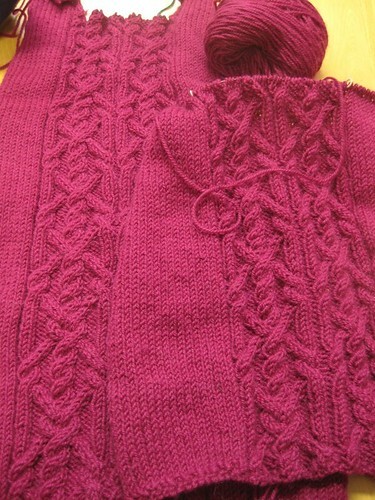 A couple of weeks ago at the Vogue Knitting event of my classes was with Anne Hanson, on sweater fit and modification. (Hint: your body is probably not the same as the pattern schematic’s body. the only sweater that will fit your body exactly is one that you’ve either written for yourself or modified from the pattern instructions.) We were meant to bring a pattern, yarn, and swatch with us as part of the class work, and I did so, thinking that I’d just use them for the validity of the exercise and then carry on knitting all the other things I had to work on. And then, a fun thing happened. After the class, it occurred to me that I really did want to make the sweater. So I cast on. It’s the Dusseldorf Aran pullover by Fiona Ellis, which I remember being interested in when it came out in Interweave Knits a year and a half ago. I matched it up with some magenta Berroco Ultra Alpaca purchased last March (yes, it really is that pink), because this winter already feels like it’s going on forever and I could use some magenta in my life. It’s great. It’s turned into a “knit on this for at least 10 minutes in the morning” sort of project, and the cables are gently rolling along and the colour makes me happy. Here’s hoping you’ve got some delicious winter knits on your needles. Happy almost weekend! 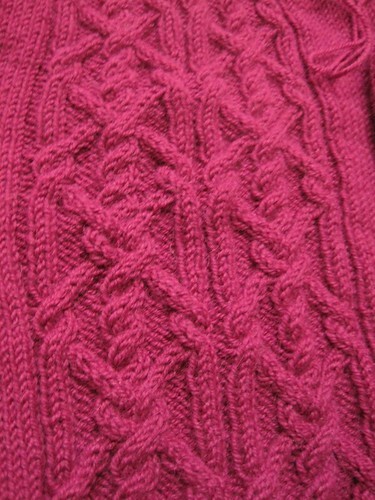 Don’t you just love the way Ultra Alpaca knits up with cables? I am one of those knitters, though some times I do knit things according to the pattern someone else has made.. But very rarely. I like turning off my brain, which is always going, from life stress and work stress and thinking about all those things, and just knitting doesn’t do that for me. When I am making something up, it takes all of my brain energy and it means I can let go of everything else and just focus on the knitting. It’s peaceful for me. But everyone is different and we have different ways we need to relax, so to each their own. That’s why I don’t design, except for like one hat a year! I’m like Jen, and am a long-time knitter, and most of that was without patterns. But, I recently decided to give patterns more of a chance and I can say that I really do enjoy swatching, adjusting, and then letting the pattern take the reins for once. Love the color and the cables! Colours are lovely when it’s February and not really winter but not really spring, either. All we have right now is wet and grey and murky. I’m knitting a green Honey cowl in hopes that it’ll become warmer out soon (it already has, but the wind is something nasty). That magenta is really lovely, and cables seem just the thing right now. I understand what you mean by wanting to turn your brain off. I haven’t made any designs and probably won’t until I’m out of college. I can definitely come up with designs, but I can’t put my brain to that much work with all of my school work (Chemistry Education major, Biology Education minor) that takes a LOT more thinking than many other majors do. So for now, I’m content following patterns and only using my brain to make little alterations if necessary. I have enjoyed your blog for a while now. I’ve often wondered how you can manage to produce so much unique and original knitting while working full time as an academic! I’ve only been knitting for 3 or so years, and at first felt ashamed that I wasn’t able to simply read EZ and come up with all sorts of clever knits that fit well all by myself. After a while I realized that there is nothing wrong with that. I was never particularly creative or crafty in the past. Spatial reasoning is not a strength! My job requires vast quantities of attention to detail, difficult decision making, hours and hours of conferring with patients and family and staff. Sometimes the responsibility of life and work is more than enough. Now I realize that it is a great comfort to sit down and (within bounds of reason) follow directions from someone that I admire, like Ann Budd or Pam Allen (or you! ), and that there is nothing wrong with that. I know that wasn’t exactly the point of your post, but I just wanted you to know that I enjoy your blog and your work and wish you the best. Whatever knitting you enjoy is a good thing! I’ve just found your blog and I’m so pleased! I need some fabulous inspiration in the realm of knitting!!! *whispers* I’ve only JUST learned to read a knitting pattern and sometimes make adjustments because I now know that I can’t be trusted to make even cast-on for write warmers, so need to do a rib cast on so it’s stretchy, then sometimes it all gets a bit hard so I make it easier! I’m looking forward to the moment when I make it over the hurdle from “advanced beginner” knitter to “medium” knitter! That is some yummy colored yarn. To be truthful, I’m not all that big on pink as a color, but THAT — that has some guts. Which is why it’s ‘magenta’, and not ‘pink’. 😉 Luscious cables, too. Can’t wait to see the FO pics! I’m with you – after putting a lot of time and energy into spinning a sweater’s worth of yarn, I recently chose an excellent pattern by someone else rather than designing my own. I just wanted sheer fun of knitting with that yarn, rather than the worry of all those decisions. Maybe someday when getting the spinning right doesn’t take as much energy, but for now, I’m delighted to knit others patterns. You’ve chosen a lovely one, yourself! Like other posters I agree completely! Sometimes I need the simplicity of knitting someone else’s pattern. And I frequently learn something new in the process! Some of us got backed into the “design your own stuff” corner by being decidedly non-standard sizes (i.e. ample) when most sweater patterns went all the way up to 38″. (Ooooh.) And once we figured out the basics of upsizing, we were off and knitting — sometimes with good results, sometimes with ponds full of frogs. And if you look at the “I always make up my own pattern” knitters, you may find that we’re frequently re-knitting the same schematic, just altering gauge or pattern stitch, because we’ve finally evolved a pattern that fits and flatters. That said, I ***love*** it when a designer does the work for me, and thank goodness there is now such a wonderful size range out there for most sweaters. Sometimes very nice people, on looking at one of my semi-originals (see LyndaInOregon’s Diamond Lil on Ravelry) will say “You should sell that.” Yes-but that would mean I’d really have to WORK to figure out how to make it ffit someone else! Now ***that’s*** brain strain!